It occurred to me that I haven't posted anything in a while. Well, "a while" for me is 5 days; I realize many bloggers hardly post anything at all and for them, every 5 days would be considered frequent, but 5 days without a post is a long time for me. I really don't have much to report. I did my usual Saturday Costco visit this morning and saw that strawberries must be in full swing now because the price came down from $7.95 for a 4-lb box last week to $5.49. I bought some last week and for the most part they were on the watery side. I took a chance and bought more this week so we'll see how these newer ones are. Other non-standard items: a bottle of Louis Latour 2008 vintage Pouilly Fuisse, and a pair of cargo shorts since summer is approaching (by pair I mean just one item but why they call it a pair is one of those confusing issues.. like a pair of pants - is a pant one leg? But then what do you call the upper part of it then? Or is a pant the entire one side of a pair of pants? The second book is one that I know will come in handy, although I'd just as soon not admit that I'll be needing it soon! 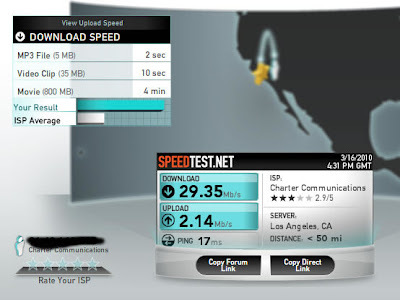 The other day I mentioned how amazed I was at the download speed of my ISP, and then posted a poll asking for responses as to how fast your ISP was. Well, the response was as apathetic as a typical election, with only four votes cast. Of those four, one person had speeds between 15-20 Mb/s, two had speeds between 10-15 Mb/s, and one poor soul (is that you, Donna?) had speeds less than 3 Mb/s. That last one has got to be a DSL speed! Well, I guess we should all consider ourselves fortunate because we should remember back in the day when 56K modems were supposed to offer blazing fast connections. Just as I suspected. Our internet connection at work is pathetic. No wonder pages take so long to load and half the time don't even load completely. Maybe it is because everyone is surfing when they're supposed to be working? For whatever reason, that's pretty sad when my home connection is about 10x faster than work but I am sure we are paying tons more for the work connection. I think what is needed is to add something like a flex capacitor to it. I see that the historic health care bill was passed today. I haven't paid that much attention to it because I figure it doesn't matter how much attention I pay, the bill is the bill and if it passes, it passes. What does concern me, however, is it is sad that the true problem has not been, nor probably ever will be rectified. The real problem, and why we have such a mess in our health care system is pure and simple: greed. And because of greed, the costs of obtaining health care in this country are very high. So no matter what sort of solution is proposed, it is not going to work unless the solution is to lower the costs of health care. One way or another, these astronomical costs have to be covered, whether by you or me or someone else - they have to be covered. What causes health care costs to skyrocket? All the people along the feeding chain who put their hands out - attorneys, doctors, insurance companies and patients who take advantage of the system. The problem is, you are never going to be able to do anything about the attorneys, doctors or insurance companies because they are the ones greasing the palms of the politicians who pass the laws. And as long as each member of this evil axis gets rich, they could care less what the other two members do. And there will never be a shortage of patients who take advantage of the system as long as the members of the evil axis continue creating loopholes and other opportunities to be taken advantage of. I'm not saying all attorneys or doctors or insurance companies are bad, but there are far too many greedy people within each group and they operate within a system that encourages this to continue. What politician is going to bite the hand that feeds them? The politician who resists corruption and puts the interest of the country ahead of his or her own interests when the two do not coincide only exists in the movies. That means costs are going to continue spiraling upwards. That means the problem is never going to end because someone has to pay these costs. And these "someones" do not have enough money to pay them. It is as simple as that. Until you address this real issue, all you are doing is shifting the burden from one sector to another but it never goes away. Today's YouTube has embedding disabled by request so you will have to click the link to go to the YouTube site to view it.. and you will see an unfortunately startling resemblance of the main character in the video to a real-life main character. Click here. I took a chance and bought some strawberries at Costco today. Is it that season already or was I premature? Haven't tried any yet. And below is a short video of my dad hamming it up on stage. He gets tired a lot faster these days but considering how old he is, that's still quite the accomplishment. I think about all the aches and pains I have now, and how much harder it is to go running and then think about how much older my dad is than me.. there's a lot more years between us than the difference in our energy levels, haha.. I don't know why, but some things really, really irk me. I think it has to do with people trying to take more than their share. That's how I felt when I read an article in today's (Thursday) L.A. Times about a man who tackled a would-be bank robber, thus thwarting the attempt, but got shot in the thigh while doing so. The bank sent him flowers, an invitation to lunch, and made an offer to pay for the medical bills incurred as a result of his injury. He says that isn't enough, and has hired an attorney to sue the bank for negligence. He says he should get some sort of reward for what he did, and the bank was negligent with respect to keeping its customers safe because the security guard was in the parking lot at the time the attempted robbery took place. Who asked this guy to be a hero? Is the bank liable because he was stupid enough to endanger his life and those of the other customers and bank employees because of his actions? And last I looked, most banks have a security guard who patrols not only the inside of the bank, but the parking lot as well. Had something happened to a customer in the parking lot, should the bank be sued because the guard was inside watching that part of the bank? It's like if I give you a donut, which you didn't ask for, then I demand that you pay me $25 for it. I got so mad I sent an e-mail to the reporter. And when I think about it, it gets me mad again so I just had to write about it on this blog, too! After running Speedtest on my internet connection the other day and posting about it, and then reading Donna's comment, it made me curious as to what speeds other people are getting from their connection. 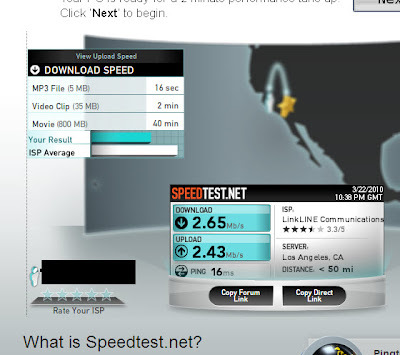 Obviously if you are reading this you must be on the internet so you have no excuse not to head over to Speedtest.net, click on the button to conduct the test, and then see your results. So please do that, then come back here and take the poll below. Thanks! Oh my, isn't that sad? Yup, it is getting harder and harder to read small print. I used to just take off my glasses and focusing would be no problem but these days it gets harder and harder. So when we went to Wal Mart the other day, I headed over to the school supplies section to look for a magnifying glass. I knew I could count on them to have one. Actually it is not a magnifying glass, it is a magnifying plastic but it does the job. I bought a couple of electronic chips recently and the print on them was so tiny and faint that I simply could not read them. I figured a magnifying glass is something that is always good to have on hand. At least I haven't had to start ordering large-print versions of books yet. Or loud-sound versions of CD's. Or large-picture versions of DVD's. I was supposed to do my income taxes today. Supposed to.. so you know the ending. Instead, since Julie went shopping this afternoon, I spent most of the time listening to a bunch of music on CD's and DVD's. A much better use of time, if you ask me! San Lorenzo - Pat Metheny Group. This is one of my all-time favorite songs from one of my favorite albums. This first track I would describe as the soundtrack for the best vacation you've ever had. It is simply an incredible composition. Last tracks on Abbey Road, from, You Never Give Me Your Money, to the end of the album - The Beatles. This is such a great progression of songs. If you ever forget why the Beatles were so revered, just listen to this. Thunder Road and Born to Run - Bruce Springsteen. The volume was turned up fairly high on the preceding tracks but went higher for these two. The Boss was so amazing back in the 70's. This stuff is better than anything in the rock and roll arena that anyone came out with in the following three decades. Mother and Child Reunion, Duncan, Me and Julio Down By the Schoolyard, Something So Right, and American Tune - Paul Simon. I played these albums a LOT back in the 70's but can't remember the last time I listened to any of these except for hearing one or two on the radio. It was just nice to hear and appreciate them again. Dialogue Part I and II, Saturday in the Park, and Goodbye - Chicago. Before they got goofy, they used to be really good. This fifth album was a departure in style from what came before but it is still one fine album. Dialogue really rocks; Saturday in the Park is the perfect weekend celebratory tune. I Feel the Earth Move, So Far Away, It's Too Late, and Home Again - Carole King (on SACD). It's a little early to play this one because for me it is a summertime album. Takes me back to 1971, one fun summer. This is one of the best albums ever recorded. I am so happy that Carole is still going strong after all these years, too! Pines of Rome, Rhapsody In Blue, and Piano Concerto No. 2, Allegro, Opus 102 - from Fantasia 2000 (on DVD). I wanted to have some video accompaniment to the music and you can't go wrong with this disc. Spiral, and If - Hiromi Uehara (Live in Concert DVD). This is an odd DVD because it is recorded in regular stereo. And the recording level is on the low side so you have to really turn up the volume. Those quirks aside, if you want to see/hear one fantastic piano player, watch and listen to this. She is amazing. The bassist and drummer are incredible, too, but the spotlight is on Hiromi. Her fingers fly so fast over the keyboard that you soon stop paying attention to her big hair, haha.. There's simply too much to listen to and not enough time! I was thinking maybe I should have one of those music servers that people use so I can pick and choose what tracks to play instead of getting up and down to change discs. I don't have much to report about my weekly Costco visit, only this: my normal routine is to stop at their gas station and fill up the car (no matter how little gas is needed; since I'm there I might as well take advantage). By the time I finish with that, it is usually a few minutes before the 9:30 opening time. Today I parked the car at 9:26 and noticed that there wasn't the usual line of people crowded at the door to get in. In fact, there wasn't anyone. I wondered if they had changed the time they open. I decided to get out and get a good place in line - well actually, a good position since there was no line. Apparently a few others had the same idea because by the time I pulled out a shopping cart and got to the door, there was someone in front of me. As I stood there waiting for the door to open I thought, "wow, what a luxury, here I am way up in the front of the line. No waiting!" By that time a lot more people had gathered but they were all behind me. Haha, isn't it funny what things we value in life..
That made me think back to the one and only time when I had front row seats for an event - way back in college days. Amy and I went to the ice capades. Or at least I think it was the ice capades. Or some show on ice. Or maybe it was the circus? That was so long ago.. well, anyway it was something where there were a bunch of people and the show took place in the middle of the arena which was either the Forum or the Sports Arena. Gee, now you are probably thinking maybe this never even happened and I am imagining it. But whatever it was, we did have front row seats! When the show was over, the skaters came over and shook hands with all of us lucky folks in the front row. Made us feel kind of important. Well, there's really no point to this except that I happened to think about it after this morning's rare occurrence of being nearly at the front of the line at Costco. Some advice: do not attempt this at Wal Mart on Black Friday. Did I already use this title before? I don't remember.. well, that was so long ago it doesn't matter anyway. My good friend J sent me a link to a blog that she said brought back lots of memories so naturally I had to check it out. 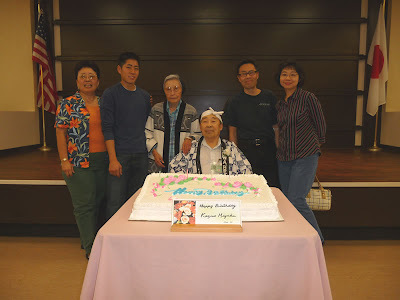 This blog is devoted to your stories and recollections on the Asian American dance scene in Los Angeles at places like Rodger Young's and the Elks Club, listening to the bands Carry On, Free Flight and Winfield Summit. Collecting the stories is important because it was “our” time as Asian Americans. The decade of the 1970s was a period in the awakening of Asian pride following the Civil Rights movement, and minority groups were instilled with self-esteem in ethnic identity. Now for someone like me (and perhaps some or many of you out there), how could this blog NOT be interesting? Those were some great times..
Hey, happy Friday to you all - too bad there's no dances going on this weekend, haha.. or did anyone check out Blarney's or Rodger Young to be sure about that? After pondering things a bit more, I've decided to drop my idea of a class action lawsuit against the stapler companies. I was influenced in part by the comments left by "Anonymous." My first inclination was to open a staple repair business. People with oneseys and twoseys would mail their stapler to me and I would fix it with some WD-40 and secret ingredient. And I would do on-site repairs for volume jobs. But an even better idea came to me - I am going to open up StapleMaster School of Staple Repair. People looking for a staple, er, stable career can be pioneers in this soon-to-be lucrative vocation, earning their CST designation: Certified Stapler Technician. I figure that's better having a school. If I ran a repair business, it might be hard finding any customers until people caught on to what a useful idea that was. Meanwhile, I can instead charge students fees to become certified and then it's up to them to find a job out there. Once I get established, then I'll initiate that class action lawsuit. Gotta do things in the right order, you know! 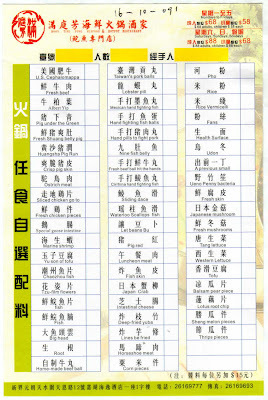 Maybe I will call it United School of Staple Repair instead..
Go to a Chinese restaurant. The usual one will be so noisy that you won't have to worry about holding up your end of the conversation. If someone says something to you, you can either (1) pretend you are responding by moving your mouth but not really saying anything; or (2) look at them and tilt one ear towards them and put your hand next to it to signify you can't hear what they are saying. If you go the first way and the other person leans forward and tells you to speak louder, just keep doing the same thing but look more energetic as you do it. Finally, toss up your hands in exasperation and shake your head from side to side, then point at your neck. If you go the second route and the other person keeps talking louder and louder, just keep motioning to your ear and frowning, then finally as in the other way above, throw up your hands in exasperation letting them know that no matter how hard you strain, you can't hear them. Now, this doesn't work if the other person winds up yelling so loud that everyone else in the restaurant stops talking. But that is doubtful.. no one can talk that loud. I hope that was helpful. Here's an observation I have from countless times dining at Chinese restaurants. Why, when there is a lazy susan on the table, do people put the serving spoons back on the plate so that they are hanging over the edge of the lazy susan?? Then when someone turns it to get a dish, the spoons end up either knocking over someone's glass or else falling off the plate. Yet, 99% of the people still keep doing this. That really bugs me! Something else that bugs me is when someone takes it upon themself to serve everyone else at the table. They get a spoonful of food from the dish and then lean wayyyy over to the opposite side and have to pretty much toss the food that last little bit of the way in order for it to land on your plate. I know they are just trying to be polite, but why do they do that??? That's why you have a lazy susan on the table!! Some people get up and down so often doing this that it begins to resemble whack-a-mole. I did my traditional Saturday morning trip to Costco and managed to get that all done before the rains showed up. Nothing really new to report, though. Later in the day I had lunch with Katie at an old favorite, Angelo's in Alhambra. When the kids were little we'd take out pizza from there nearly every week. And every week, the same thing: 1/2 pepperoni and olives and 1/2 sausage and olives. Today we dined in. The pizza has gone up in price since those days but it is still yummy and worth the money. Katie said she was hungry.. I was, too. We ended up ordering a small Angelo's Deluxe. "Small" over there means a 14" pizza. 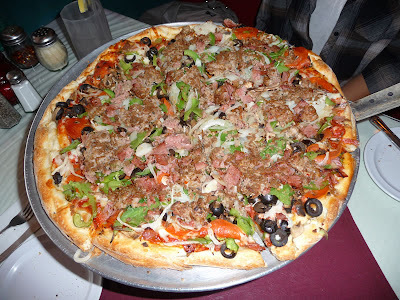 We also ordered the "thin" crust, something we've never tried before but the regular crust is so filling we thought maybe we could eat more of the pizza if the crust was thinner. 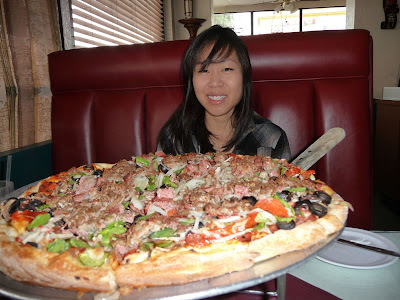 Here's a picture of the pizza by itself, and then so you can gain a perspective on how big it really is, a picture of Katie sitting across from it. That's no small pizza! Angelo's "small" is bigger than any jumbo deluxe extra large gigantic-size you might find at Pizza Hut or Dominoes or any of those other chains that are poor excuses for pizza. And you can see the toppings are rather plentiful. This is not deep-dish pizza but it weighs more than any other pizza I've ever had... you would think it was inside of a frying pan, it's so heavy. We managed to eat half (2 slices each) and took the rest in a box. That was one heavy box.. again, just that 1/2 pizza must have weighed more than 3 extra large whole pizzas from any of the chains. The "thin crust" turned out to be about what a regular crust is anywhere else. Was it good? Oh, yes.. We had our calorie fix for the day but it was worth it. I ran out of staples in my stapler today. I notice that when it gets to the end of the strip of staples, the last two or three tend to come out crooked and it doesn't staple properly. When I put in a new strip of staples, I always lose the first one because when I close the stapler, it pushes out that first staple, unused. I looked at the staple box. Each strip has 210 staples. If I lose the last three, and lose the first on the next group, that is a total of 4 staples. That is 1.90476% of the strip that is unusable and goes to waste. Therefore, it follows that for every dollar we pay for a box of staples, nearly two cents of it goes to waste because we are paying for something we can't use. Does anyone out there know of a good class-action lawsuit attorney who works on a contingency basis? I think I am on to something here. This could be big. As far as I know, this problem is common to all staplers so we are talking action against every company that makes staples/staplers. Let's say that this is a billion-dollar industry. We are talking about a potential settlement of $19,047,600 which, after the attorney fees and expenses, would be close to $190,047.60. I feel this is worth pursuing. Receiving a coupon redeemable for a free strip of staples would be pretty good, and also let the industry know that such things are not to be taken lightly. So who's in with me? Perhaps it is just me but I find that there is something strange about the people inhabiting Cheerios television commercials. There are various commercials for their various products and there seems to be a common thread tying them all together. They choose a certain sort of actor that makes me uneasy. These are not normal people! It's like when Tom Cruise realizes his fellow attorneys are not like he thought they were when he first joined them in The Firm. Or those Twilight Zone episodes where the people of a town turn out not to be what they seem. It wouldn't surprise me to see some pods hidden behind the props on the set of those commercials. Instead of falling asleep and having the pod take over your being, this change takes place from swallowing a spoonful or two of Cheerios. I get a bad feeling about these commercials..